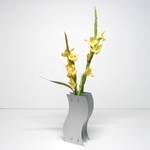 The simpler the flower arrangement the better! 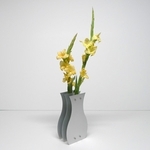 The vases of ARCHITECTs Touch all have one thing in common... Simple Elegance. 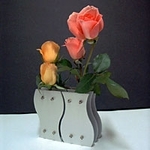 Our original aluminum vases visually interlock to create clever pairings. They're perfect as sets or multiples... Designed in-house, they're only sold here! 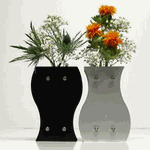 A black ceramic vase with simple lines to set off any flower arrangement beautifully. 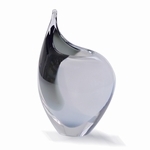 Our crystal vases are imported from a small manufacturer in the Czech Republic. 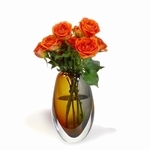 They have gentle shapes and rich coloring. 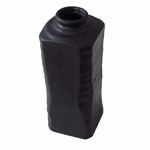 The Carved Wood Vase is imported from Thailand. 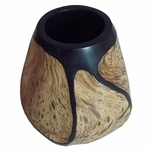 It's carved from mango wood, and has a distinctive look and finish, hand applied by Thai craftsmen.